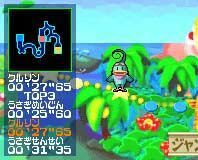 Once in a while a game comes along that slips under everyones guard and never really gets the kind of recognition it deserves, and Kuru Kuru for GBA is one of them. This title is in the exclusive club of being released in Japan and then Europe and Australia, but not being released in the United States, this happens very rarely, and because of this not a great deal of information regarding this title has been reported in online or other media. Kuru Kuru gets back to some real gaming basics, not complicated by any kind of complex button commands or intensive text and such. 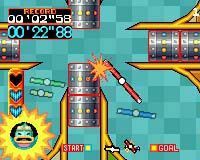 Most resembling the obscure PS1 title Irritating Stick, Kuru Kuru involves you navigating mazes of varying size and difficulty with a rotating bar (it is in fact the blades on your characters helicopter type craft). The catch is that you lose your health points when the blades touch the sides of these mazes, you start out with three hearts and each time you touch a wall, or object you lose one. There are regeneration points along the way that give you back your health and give you a chance to catch your breath and plan how you will approach the next section. Your helicopter blades are constantly spinning and it requires some very tight timing to get through some of the later levels, especially when moving objects are thrown into the mix. You can also hold down the A or B button when moving to speed up your movement, which increases your risk of hitting the sides, but it is also the only way to get the fastest times on some of the mazes. The difficulty curve on the mazes is just enough to keep you thinking and learn how to get by most obstacles. At about the halfway point the difficulty really kicks in and some of the last courses can be incredibly tough to get through. The pure simplicity of this game fools you into thinking that it will be easy but this deception is what gives Kuru Kuru such an incredible addictiveness. Everyone who plays it instantly falls into the "just one more try" syndrome. Very few games manage to get this addictive, and with the principle of the game being so simple almost anyone will be able to enjoy this game in its entirety. The main story mode is very long, there is certainly no shortage of mazes, and with the difficulty curve it will keep you very busy, especially when trying to get the fastest time for each one. There is also a spectacular multiplayer mode where up to four linked GBA's can race against eachother in a huge amount of different mazes, this only requires one cart and the obligatory link cables, which make this the best value multiplayer GBA game on the market. Graphically this game is very bright and colourful, but the simple game design doesnt exactly push the GBA's hardware. Theres is some nice and smooth sprite rotation on your helicopter blades, and the engine never slows down or misses a beat, even in mulitplayer, which is really what matters. The sound is very cutesy and japanese which i think fits the style of game perfectly but its really down to personal taste. You really can't beat this game for value, especially with the multiplayer options, this game is highly recommended to anyone of really any age. 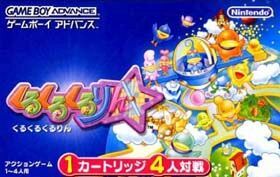 It delivers on every level that you could ask of a portable title, and when compared to a lot of the GBA "shovelware" thats out for the system Kuru Kuru Kururin comes as a virtually "must have" title.